K&C Collectibles has added LEGO, 30th Anniversary Saga Legends and Star Wars Insider #171 (Comic Store Exclusive). Click the NEW PRODUCTS link under the Categories Section for a complete list of recently added items. 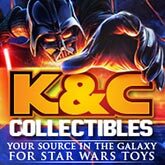 K & C Collectibles has added new Hot Wheels Die Cast Ships, Hot Wheel Character Cars, Star Wars Celebration Anaheim exclusive Pins, and Lightsaber Chopsticks. In-stock Mission Series action figures 2-packs. Click the NEW PRODUCT link for a complete list of recently added items. 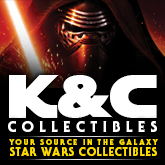 K & C Collectibles has added a few Star Wars Celebration Anaheim exclusives. 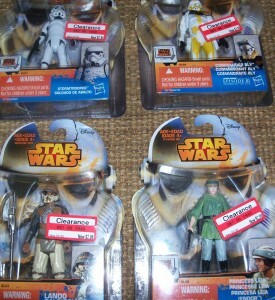 In-stock Mission Series action figures 2-packs and Saga Legends. We have joined Twitter – Please follow us for updates and specials. Click the NEW PRODUCT link for a complete list of recently added items. 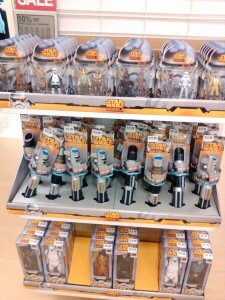 It appears that the often maligned Saga Legends assortment of figures has been placed on clearance at Target. Reader Rich S. writes in with a report from Spokane, WA on his find. The Yakface Toyguide updates resume with the latest entry in the Star Wars Rebels 3-3/4″ line. Next, we take a look at the Luke Skywalker and Han Solo Mission Series set (MS15). PROS: The Mission Series sets (and Saga Legends figures in general) have come a long way since their inception. Sure, you’ll still run into some jacked paint apps here and there, but Hasbro has made these two relatively simplistic figures in to some of the best incarnations in this outfit ever. Seriously, grab a copy of The Ultimate Action Figure Collection and compare the sculpts of these figure to previous versions. 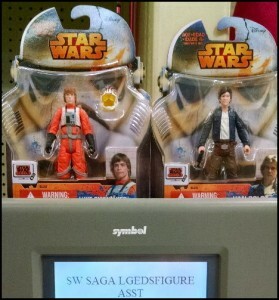 Taking articulation out of the equation, it’s hard to find fault with either Luke or Han. 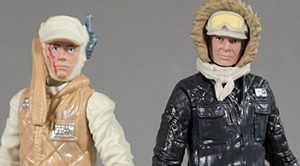 CONS: Due to their limited articulation, these figure won’t be riding a Tauntaun anytime soon, unless you have some Vintage Kenner ones laying around –admittedly we didn’t see if they’d even fit. Head to the toyguide for the full image gallery and to judge for yourself whether this set is worth adding to your collection. UPDATE 2: Star Wars: The Digital Movie Collection Coming to Vudu? We’ve been wondering for a while what the deal is with Hasbro’s Digital Release Commemorative sets, well wonder no more as we can now confirm that the Star Wars saga is coming via digital release through Vudu.com. 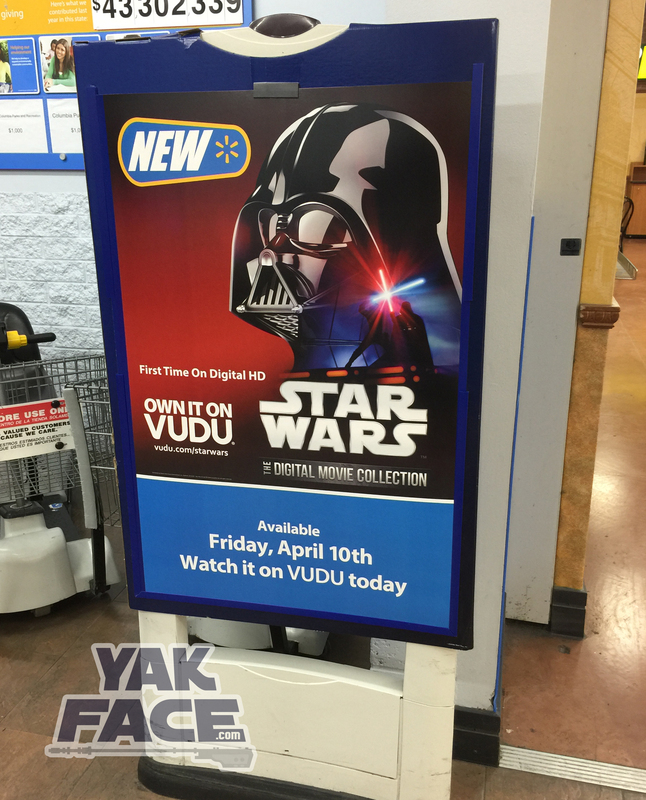 The url (vudu.com/starwars) is currently inactive, but Walmart is now displaying marketing with the announcement stating an April 10 availability. Click the image above for a closer look. Thanks to swshadow07 for the image. Better late than never. Flyguy and Yakface are back to break down the latest collecting news from the past week. On this episode, we discuss the new Black Series products hitting eBay, new product listings hitting Target’s DPCI database, the confusion around the cancelation/discontinuation of some Saga Legends case assortments and Hasbro’s absence from presenting at Celebration Anaheim. Funko continues to churn out product this week including the return of a retired POP bobblehead as well as several exclusives planned for Celebration. Play Arts Kai figures made quite and impression on collectors this week with the reveal of not one, but two figures: the Stormtrooper and Boba Fett. Will these figures tempt you to the dark side? All of this plus Celebration news, reviews and our latest toy purchases, acquisitions and more on Episode 57 of The Realm Recap! 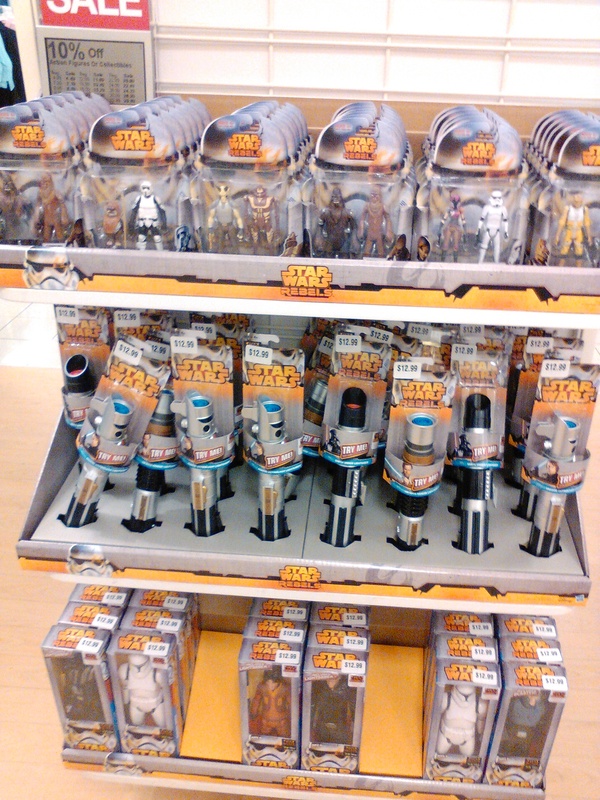 Went to Kohl’s today in Sacramento area of California and came across this end cap of Rebels figures, the 2 packs were $14.99 with 10% off. Thanks Tim! I really like that display tray that they are sitting in too. Hmmm….